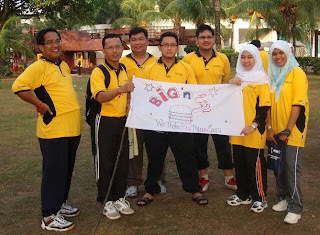 Last Sunday, my company organized a team building between our company, MMC and our client, PCSB at Impiana Resort, Cherating. It's for bridging the gap between the two so that, in the future, communication is smoother. It was a great event, really. We were told to make replica out of all the natural resources we found around the Impiana compound. 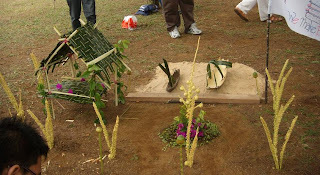 We should win first place for this as none other group came close to our great design (chewah!) but sadly, another second place. Why? 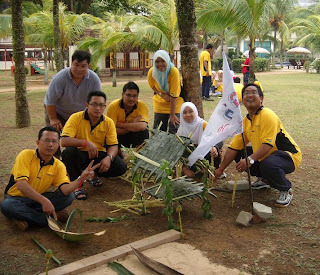 Because we used red "tali rafia" to hold the hut together. It was not natural. Well, maybe someone should've told us that earlier, isn't it? With the prezzie we won. This is one of the three. We won second place for Sandcastle and Replica and also, third place for treasure hunt. 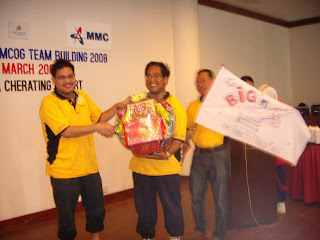 The best thing is, we won the best Outstanding Group aka Overall Champion...hehehe...best2...next year kena buat lg nih..
bestnyer team building!! hari tuh aku call takde sape angkat plak...mcm biasa la number last 100kan. 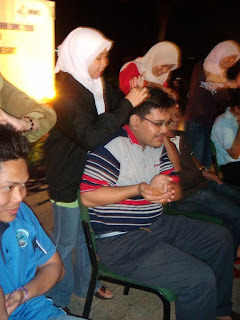 heheheh...anyway, good to hear happy2 nih. aku tgah main squash masa tuh..baru nak angkat tp dah putus..ader gak try call opis ko tp asyik masuk voicemail jerr..